Visual Studio Code>Programming Languages>CS-ScriptNew to Visual Studio Code? Get it now. Execution, debugging and editing C# scripts (powered by CS-Script engine) that target .NET and Mono (no .NET Core required). A single C# file is all that is required to run the script. This extension Intellisense support for VB.NET scripts is currently limited to Windows only. 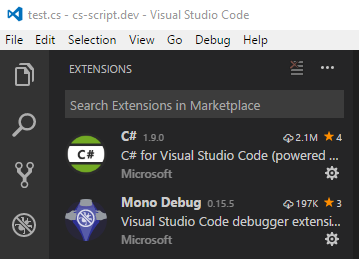 Note this extension depends on "ms-vscode.mono-debug" and "ms-vscode.csharp". Thus if these extensions are installed but function incorrectly please log error reports at their corresponding web sites. Read section "Minimal set of dependencies" for more details. The extension implements its own Roslyn-based Intellisense functionality fully integrated with VSCode infrastructure. Though you can always opt to the VSCode built-in Intellisense engine OmniSharp. See Using CS-Script IntelliSense section for details. Currently VSCode support for C# is heavily oriented on development for .NET Core (e.g. ASP.NET Core). This imposes serious limitations on developers who is developing for desktop and server using C#. This project is aiming for filling this gap. The extension provides a thin layer of own functionality. Its primary responsibility is bringing together IntelliSense services, a full scale debugger (curtesy of "Mono Debug" team) and CS-Script seamless C# script execution. This page contains only a light overview of the extension functionality. The complete description can be found at the project Wiki. 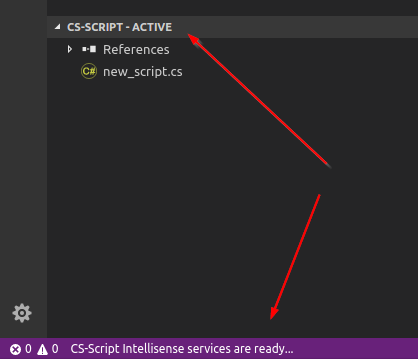 Apart from the common VSCode C# functionality the extension brings CS-Script specific user activities in the picture. Note, you may need to add Mono to the system path manually if it didn't happen for you during the Mono installation. All C# editing support available with VSCode, including Syntax Highlighting, IntelliSense, Go to Definition, Find All References, etc. Debugging support for .NET (Mono and Desktop CLR). This is something that currently is impossible with other extensions. Direct execution of "plain vanilla" C# files without defining any project infrastructure. You can also execute classless script without entry any point. See auto-class for details. Converting/Building a script into an assembly or a self contained executable. The extension is supported on all OSs where VSCode can run. Below are the road map highlights only. Some more detailed information are available in the last section of this document. CS-Script.VSCode allows convenient editing and execution of the C# code directly from the editor. A "C# script" is a file containing any ECMA-compliant C# code. While other C# based runtimes require C# code to be compiled into assemblies CS-Script allows direct C# execution by generating the assemblies on-fly. Thus you don't need to have any script specific configuration for executing your script. A single script file is fully sufficient as it contains everything that CS-Script needs to know to execute the script. While the extension is published on VSCode marketplace the latest unpublished[releases can be accesses on GitHub releases page. 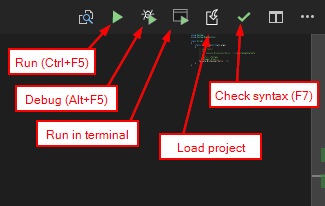 Note: you can use standard VSCode debugging triggers (e.g. F5) if you load the script as a workspace. See 'Load as workspace' section. Open the C# file and start using normal intellisense triggers with CS-Script specific symbols: hover, go-to-definition, autocompletion, find references. Please note that CS-Script IntelliSense is only enabled when no workspace loaded. This is done in order to avoid any interference with the standard VSCode Intellisense for workspaces. CS-Script and VSCode are following completely different project paradigm. By default, when you just open a C#/VB.NET file the all development activities are handled by the CS-Script extension infrastructure. However sometimes you may prefer to use OmniSharp Intellisense. If it is the case you can open the script file and generate on-fly the all traditional project infrastructure - workspace (project file and folder). This can be achieved by executing the "load project" command (ctrl+F7). CS-Script supports VB.NET scripts as long as the underlying compiling services (Roslyn) support the syntax. Thus you can execute any VB.NET script by simply loading it into the editor and then executing it the same way as C# scripts. The only limitation to that is that certain Intellisesne features may not work on Linux. And you will need to place break points programmatically (image above) since VSCode does not support VB syntax natively. The extension comes with C# 7 support (via Roslyn) enabled by default. However Roslyn has an unfortunate limitation - it is extremely heavy and slow on startup. Thus it can take ~3-5 seconds to do the first compilation of a script or an Intellisense request. Any further successive operations do not exhibit any delays. Roslyn team did a good job by caching runtime instances of the compilers thus any consequent compilations will require only milliseconds to be accomplished. Unfortunately on Linux/Mono the same caching mechanism is not available so the compilation will consistently take up to 1.5 seconds (tested on VMWare Mint 18.1 4GB RAM on i7-5500U 2*2.40 GHz). Hopefully Roslyn team will extend runtime caching in the future releases of Mono. Note, the Roslyn startup delay has no affect on script execution. CS-Script uses application level JIT compilation (similar to Python caching) that avoids compiling scripts if they are not changed since the last execution.